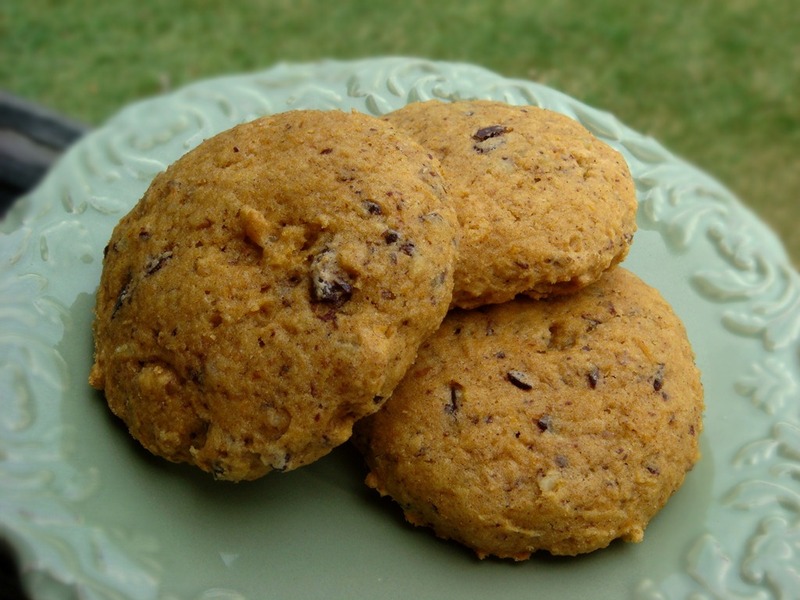 These pumpkin cookies are a soft, spiced cookie studded with chopped dark chocolate. Pumpkin cookies often have a very soft, cake-like texture with very little spread. For a chewier, less-cakey texture, combine and mix all of the wet ingredients (butter, sugar, pumpkin, eggs) at once until just blended instead of the more traditional method of creaming the butter and sugar until light and fluffy and then beating in pumpkin and eggs. Preheat oven to 350F. Line baking sheets with silicon mats or parchment paper. Use a whisk to combine flour, baking soda, baking powder, salt and spices. Set aside. Use an electric mixer to combine the butter, sugar, pumpkin, egg, and vanilla; beating just until blended (don’t cream butter and sugar first; beat together all wet ingredients at once). Mix in the dry ingredients until just combined. Stir in the chopped chocolate. Drop tablespoons of dough onto baking sheets. Use the palm of your hand to flatten cookies slightly. Bake for 13-15 minutes or until lightly browned. Let the cookies cool on the sheets for two minutes. Transfer to wire racks to cool completely.